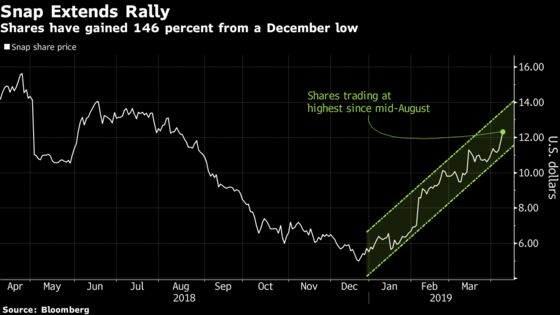 (Bloomberg) -- Snap Inc. rallied on Monday, putting the shares on track for the highest close since mid-August, after the social-media company picked up another buy recommendation from RBC Capital Markets. The stock rose as much as 6.7 percent in its third consecutive advance. At current levels, Snap is up 146 percent from its record low on Dec. 21. Last week’s 7.4 percent gain was fueled by Snap’s announcement of a suite of new products and services, including a video-game business. Analysts praised the news, with at least two firms upgrading their view on the stock. The shares now have six buy recommendations, 23 holds and nine sells, according to data compiled by Bloomberg. Social-media investors will also be watching Pinterest Inc., which is seeking to raise as much as $1.28 billion in an initial public offering expected later this month. The IPO could give the maker of online inspiration boards a market valuation of about $9 billion, which would value the company below the amount it reached in its last private valuation.